5 Reasons a Vacation to Las Vegas is Perfect for Any K-Pop Fan! Even if you're not into the partying and gambling lifestyle that Las Vegas offers, you're still bound to score some beautiful and extremely like-worthy selfies of you and your friends in many of the gorgeous displays and decorations set up in the iconic Strip hotels! From ornate Roman statues to extravagant hanging chandeliers, you're bound to get awesome shots to show all your friends. K-Pop fans love aesthetics and Las Vegas is the place to score some jaw-dropping shots. Las Vegas operates as a 24-hour destination. There isn't a time in the day or night that you won't receive service! For a K-Pop fan, who stays up late watching K-Pop streams of their favorite groups and artists, this is amazing! Now you can use the hotel wifi, kick back in your hotel robe, and order room service while you stream the latest Inkigayo episode! 3. The Art and Culture! Though many think of Las Vegas as a party destination, there's actually a rich cultural and artistic movement emerging out of the city! Huge artistic murals, galleries, cafes, and more are all a new addition to modern Las Vegas. If you're a K-Pop fan who loves to go to museums, cafes, and experience art in the fullest: this is the place to be! K-Pop fans and foodies are practically synonymous! Food in Las Vegas is beyond compare. Take this picture of just some�of the delectable desserts served at The Cosmopolitan's delicious buffet, Wicked Spoon. We don't know about you, but our stomachs already started growling! Plus, for those who can't go without KBBQ, there's plenty of KBBQ spots around the strip, including 24-hour options! What would a vacation be for a K-Pop fan if there wasn't an amazing K-Pop memory to go with it? A special K-Pop concert is coming to Las Vegas this summer called, 'K-Pop Summer Night' sponsored by Taewon Entertainment. 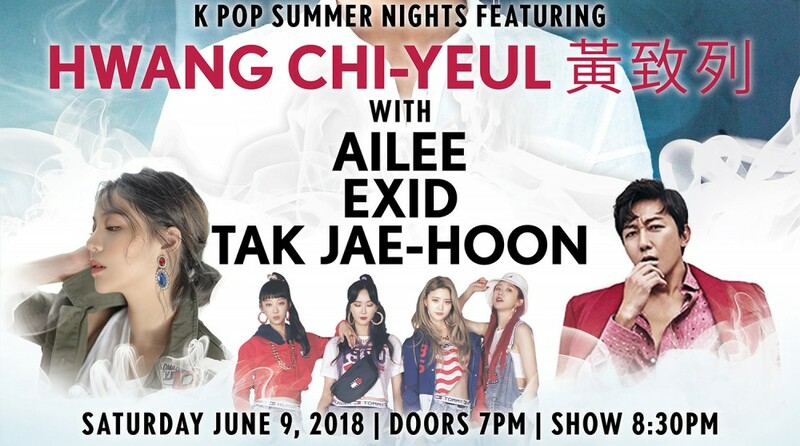 The concert takes place on June 9 inside The Cosmopolitan at The Chelsea in Las Vegas.�Veteran performer�Hwang Chi Yeol�will be headlining the event with support from incredible vocal powerhouse�Ailee, popular girl group�EXID�and entertainer�Tak Jae Hoon! This is a group of performances that comes around once in a lifetime, so don't miss out on your opportunity to attend 'K-Pop Summer Night'. I agree absolutely with everything! Las Vegas has the best shows, I often buy cheap vegas show tickets. It is the only chance to see the most popular shows for affordable prices.